Are you looking for a new bathroom ? Read our guide to get you started. Are you looking for a new bathroom? Blog - Are you looking for a new bathroom? If you’re looking for a new bathroom read our expert guide to help design the bathroom you’ve always dreamed of. Whatever your size of bathroom you’ll want to get the best for your money with your new bathroom. 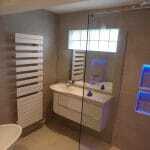 As a bathroom company we specialise in supplying only the very best quality products. 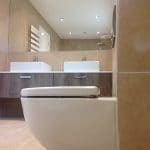 We’ve put a guide together of our recommended quality bathroom brands that from our 20 years experience in the bathroom industry we have found to be made to the highest quality, will stand the test of time and should a problem occur the manufacturer is on hand to resolve the issue quickly. One of the first things to think about when you’re looking for a new bathroom is how much do you want to spend. This will govern whether you will fit the bathroom yourself, find your own tradesmen or use a bathroom showroom that offers a turn-key solution like ourselves. Most people who visit our showroom don’t have an idea of cost so we have produced a guide on the cost of a bathroom to hopefully guide you in the right direction and help you decide on a budget. Bathrooms come in various different sizes as well as the budgets people have to spend on them. The first thing to think about when designing a bathroom is the function. Do you always shower and very rarely if never use the bath. You may want to think about removing the bath and just have a walk – in shower or consider going for the more luxurious option of a wet room. If it’s a family bathroom storage will be important and if you have small children having a bath will be important. 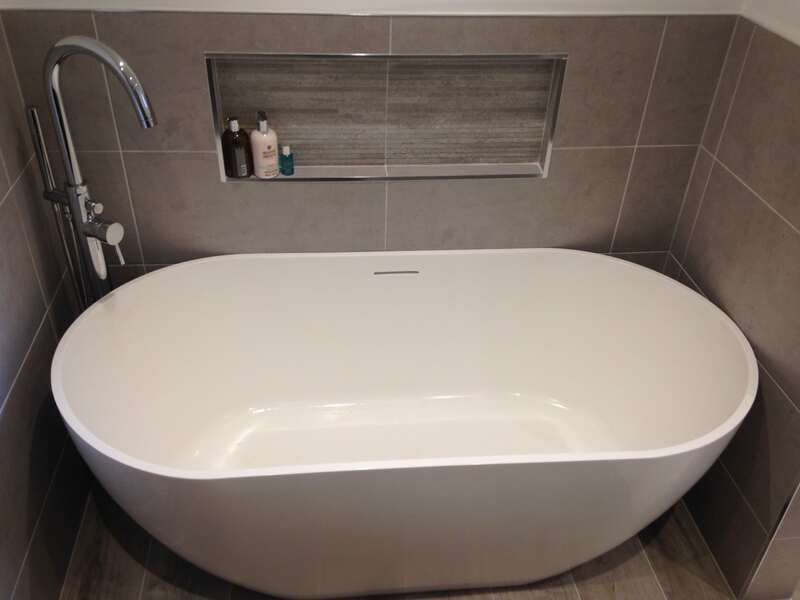 If you like to have a bath and shower try to fit in both but if space is a premium consider a shower bath which will give you the best of both and is a very flexible option. Is cleaning your bathroom your worst nightmare? Look to make it as easy to clean as possible with the use of wall hung basins and toilets to make the floor area easier to clean. Use large tiles or Nuance Shower boards on the wall limiting the amount of grout will also make cleaning easier. If you’re wanting to make your bathroom a sanctuary you can relax in consider adding mood lighting, a freestanding bath and a rain shower head. Are you a couple with a hectic lifestyle consider adding two wash basins. 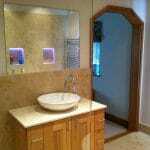 Do you use your bathroom to do make-up add a decent sized illuminated mirror. 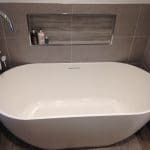 Is a bathroom just a place to get washed and nothing more you may just want to consider going for a simpler option of a standard WC, Basin & Bath. Asking yourself these questions and considering the functionality of your bathroom will help you make the right choices when choosing your new bathroom. If you’ve chosen to use one of our in house bathroom designers this information always helps them to design the bathroom that is right for you. If your looking for a more luxurious bathroom small touches can give your bathroom the wow factor. Add mood lighting on a movement sensor to come on when somebody enters the room. This is also great when you have to go to the toilet during the night so you’re not blinded by the bright ceiling lights. Go for a large ceiling mounted rain shower head. Consider going for the option of a digital shower. Digital showers are becoming more popular and have a wide variety of functionality such as preset shower settings for each user and the ability to switch the shower on remotely before getting into the shower. Use a freestanding bath to give you a large luxurious bathing area. 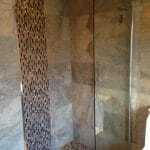 Create a walk in shower area by using a wet room system or level shower tray. Adding underfloor heating gives your bathroom that really cosy feeling and helps to dry the floor quickly after a bath or shower. The tiles and flooring are the most important decision for your bathroom. There are three main materials for tiles, Ceramic, Porcelain and Natural stone. Ceramic tiles are non porous so once fitted don’t require any future treatment. Ceramic tiles tend to only be suitable for walls as they are not strong enough to be used on the floor as they will crack. Ceramic tiles have an endless variety of designs available and are very easy to drill due to being softer than porcelain so more suited for use by the novice installer. Porcelain are also non porous so once fitted don’t require any future treatment. Porcelain is the hardest material out of the three types of tile. This does make porcelain difficult to drill but we explain how in our how to drill hard tiles video. As with ceramic tiles there are an endless variety of designs available to suit every ones taste. 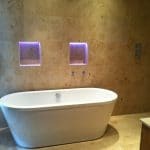 Natural stone will need to be sealed on a yearly basis if not more as they are porous, with natural stone there is also the risk of cracks developing in the future if the preparation is done correctly. As with all natural products they have faults and the slightest movement can cause the tiles to crack due to these faults. As these tiles require future maintenance only use natural stone if you are prepared to carry out the future care as failure to do so can cause serious problems. As you can see there is so much to think about with a new bathroom why not come into our Leeds Bathroom Showroom and have a chat with one of our bathroom designers who will be happy to help.